Just get on the bus and go. 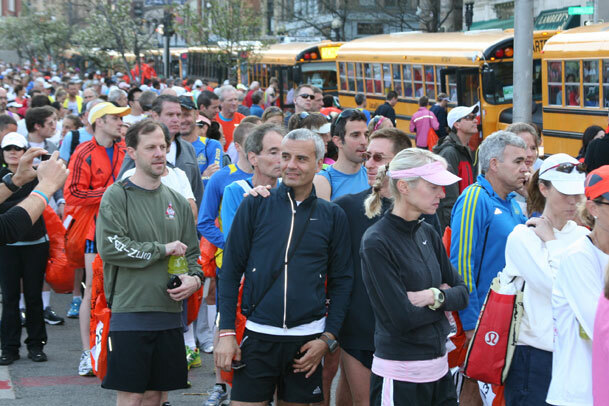 That was the sentiment from the majority of runners who lined up on the Boston Common Monday morning to board the buses to Hopkinton, where they will hit the starting line for the 116th running of the Boston Marathon. The hot topic this morning is the heat. "We'll run a little slower, but we'll be fine," said Allyne Winderman, from Los Angeles, before heading to Hopkinton. Winderman said she ran a marathon in Honolulu with temps in the 80s, but it was probably more humid than it will be in Boston today with finishing line temperatures in Copley Square forecast in the high 80s. "I'm not lovin' it," said Kristen Kelly of Virginia Beach, Va., who hopes to complete her seventh Boston Marathon. Anthony Coburn arrived from Sydney Australia to run his first Boston Marathon and his 11th marathon overall. "Chicago was hot in 2007, I remember that one," Coburn said. "I'm just looking forward to having a few cold beers afterward," said Hamish Coleman of Tauringa, New Zealand, on running his first Boston, and seventh marathon overall. "Slightly worried," was the sentiment from Kim Bench, who came from Draper, Utah to run her second marathon with her sister Amy. "But we're tough women." Look for updates, news, analysis and commentary from the following. Steve Silva, Boston.com senior producer, two-time Boston Marathon sub-four hour runner. Ty Velde is a 16-time Boston qualifier who's completed 12 consecutive Boston Marathons and 25 marathons overall. Ty is now training for his 13th Boston run and will provide training tips for those who train solo and outside, no matter what temperature it is.